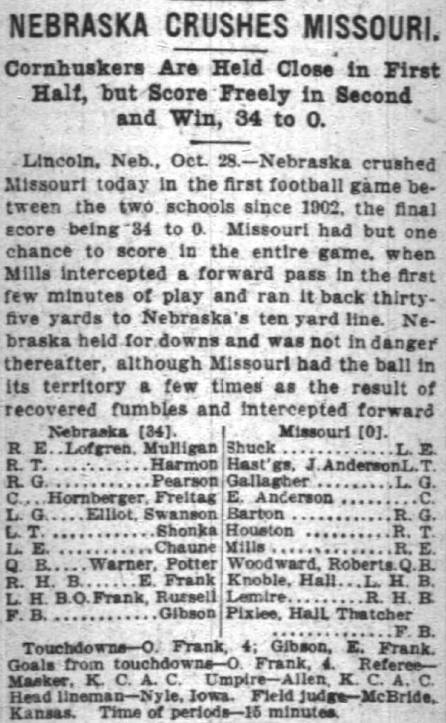 «1896: Nebraska shrugs off Wilson Tuckers 107-yard touchdown run for Missouri and rallies for an 8-4 victory in Columbia. Halfback Leonard Packards 25-yard run provided the winning margin. 1936: Lloyd Cardwells 25-yard pass reception and Harris Andrews 66-yard run lift NU to a 14-0 win at Oklahoma. | Daily Nebraskan | AP | OWH  Also, ex-Husker Glenn Presnell says hes retiring after the 1936 NFL season to go into coaching. «1971: Johnny Rodgers record-setting 92-yard punt return caps Nebraskas scoring in a 41-13 romp at Oklahoma State. Dave Mason (pictured) scored on a 28-yard interception return in the second quarter. 1976: A 98-yard pass on third-and-14 in the fourth quarter is the backbreaker as Missouri sends Nebraska to a 34-24 defeat in Lincoln. 1981: Nebraska wins a nail-biter at Missouri, 6-0, on Phil Bates 3-yard touchdown run with 23 seconds remaining. The score capped a 64-yard drive that featured three key pass completions by Turner Gill. 1986: Colorado puts the brakes on NU's running game and upsets the third-ranked Huskers in Boulder, 20-10. 1991: Nebraska crushes Missouri, 63-6, as Keithen McCant throws three touchdown passes and the Huskers roll up 500-plus yards rushing. 1996: Quarterback Scott Frost has a breakout game, passing for 254 yards as NU annihilates Kansas, 63-7. 2001: Freshman Mike Stuntzs touchdown pass to Eric Crouch on a trick play in the fourth quarter lets Nebraska pull away from Oklahoma, 20-10, and snap the Sooners 20-game winning streak. 2006: Nebraska falters after jumping out to a 16-0 lead and falls at Oklahoma State, 41-29. 2011: The Blackshirts come up big against Kirk Cousins and No. 9 Michigan State, holding the Spartans to 187 yards in a 24-3 win. Also, the HuskerMax-HuskerPedia trial ends in a satisfying verdict for this website.